Chem. Eur. J., 2015, 21, 5496–5503. c Department of Chemistry, University of Warsaw, Pasteura 1, 02-093 Warsaw, Poland. d Département de Chimie Moléculaire, équipes CIRE et CT, Université Joseph Fourier UMR-CNRS 5250, ICMG FR-2607, BP 53, 38041 Grenoble Cedex 9, France. Organozinc hydroxides RZnOH… tBuZnOH)6, possessing the proton-reactive alkylzinc group and the CO2-reactive Zn–OH group, represent an intriguing group of organometallic precursors for the synthesis of novel zinc carbonates. Comprehensive experimental and computational investigations on: 1) solution and solid-state behavior of tBuZnOH (1) species in the presence of Lewis bases, namely, THF and 4-methylpyridine; 2) step-by-step sequence of the reaction between 1 and CO2; and 3) the effect of a donor ligand and/or an excess of tBu2Zn as an external proton acceptor on the reaction course are reported. 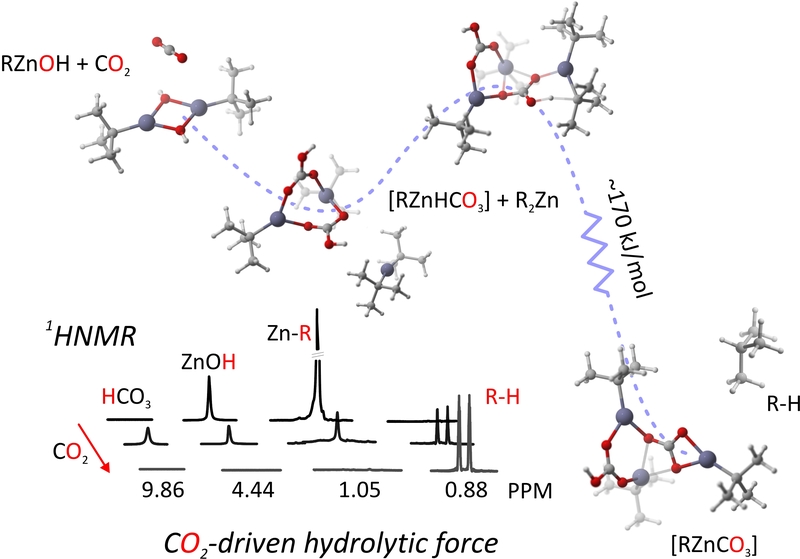 DFT calculations for the insertion of carbon dioxide into the dinuclear alkylzinc hydroxide 12 are fully consistent with 1H NMR spectroscopy studies and indicate that this process is a multistep reaction, in which the insertion of CO2 seems to be the rate-determining step. Moreover, DFT studies show that the mechanism of the rearrangement between key intermediates, that is, the primary alkylzinc bicarbonate with a proximal position of hydrogen and the secondary alkylzinc bicarbonate with a distal position of hydrogen, most likely proceeds through internal rotation of the dinuclear bicarbonate.